Well I had my month off blogging, and only kept up with other people’s blogs haphazardly, and I have to say it was a refreshingly silent month. It has given me the time needed to reassess a few things, turn some corners, contemplate the future, and come to terms better with Anthony’s deterioration. Gutsy 9, the not-so-baby peacock, is thriving and now sleeps in the wattle trees at night with the other peacocks, and is quick enough to get away from our two dogs now. 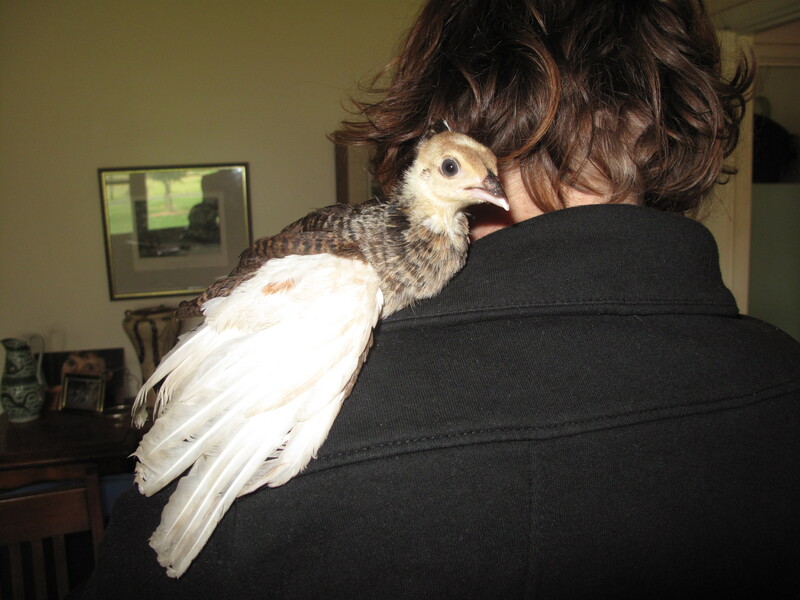 He still does madly joyful pirouettes whenever he hears my voice and loves to fly up onto my shoulder for a kiss. (I don’t have a new picture of this so have included one from when he was little. He is now twice this size, so rather heavy). Ming is still happily milking for our dairy farmer neighbours, and creating music in the evenings. He gave me 4 nights at a luxury resort for Mothers’Day – not a bad gift! I still battle bouts of volcanic grief about what is happening to Anthony, but have learned a few more ways of bringing joy back into our little family. It’s good to back and thanks for the many comments. This is a lovely community. So good to have you back. Was just thinking about you this morning 😉 Super news that Gutsy9 can roost properly and run fast enough. Nurture that joy. Hello Julie, glad to see the you are back. Take it easy though, you need time to process everything happening in your life, you need space. Welcome back. I’m glad you have found some ways to bring back Joy. I hope your Anthony is doing well. Can’t wait to see a full size gutsy photo of him on your shoulder. Welcome back U…and YAY Ming! That’s a great Mother’s Day gift and well deserved. Welcome back Julie. Good to see you in the blogosphere again. Welcome back, Julie. I’m glad you had a lovely resort break as well as a blog break. But I’m glad to see you back here. Glad to have you back! I think that your term, “volcanic grief” really says so much. Welcome back. Missed your posts. Hi Julie!! Welcome back! HUGS!!! Good to see you back. I’ve thought of you a lot. That’s a wonderful gift from Ming and love your feathery kid. Julie, wonderful to have you back with us … and I’m glad that most things around you are as normal and that you have taken time to rethink the whole situation with Anthony’s illness. You just keep the blogging on a comfortable and pleasant level for you. There is no MUST, at least not in my world here. I know you may have already done a bunch of reading and research, and there is a lot of quachery out there as well as good science, but I wanted tou to check this out if you desire to. My sis who works with seniors in Canada has seen a lot of improvement with those who use it. There are several parts to this presentation, btw. Welcome back, Take a new picture of Gutsy as soon as you can. So spooky cause I was thinking of you this morning & then here you are!! We are all so connected if we just let the light shine in. Hope you get and keep that light shining in your life. welcome back! Don’t give yourself even more pressure of making yourself blog when/if you do ot want to. Just do it as you feel that you WANT to do it! It shouldn’t be a chore. We are here regardless! Welcome back – you’re break sounds like it was helpful. It’s so good to see you. Just remember – this can be checking in, rather than throwing yourself back into the routine full-out. We all care about you and are glad you’ve posted, but I’d be just as happy for you to take whatever time you need away from this cyber-stuff. And remember – you don’t have to reply to every comment. I do, but if I were in your situation, I might do things differently. I’ve been thinking about you a lot, because I’m working just now in a neighborhood where there are peacocks – LOUD peacocks! Every time one screams I think about you and Gutsy9! Welcome back, Julie. I hope you feel refreshed after this well-needed break. I literally counted the days. I really missed you. Welcome back dear friend. So glad you’re back. Sometimes, a break is breath of fresh air, though. But we missed you. Julie! Glad your time off seems to invigorated you. I know what a strain you are under and am glad to see you coping well with what probably is the most difficult part of life. I wish you and your family the best! I know I’m late in commenting, but better late than never, so Jules…..W E L C O M E B A C K!!!!!!!!!!!!!!!!!!!!! Glad you enjoyed your break and I wish all of you the best. Oh Nia – thank you. I’m so glad to have you back. I haven’t posted much either; life sometimes just has to take center stage. Your break sounded like it was beneficial. I look forward to hearing more.